What do I like? Matsuo’s bald head. The generous slices of fish (see the sushi platter) and the freshness of his fish, which is definitely one of the best in Singapore. What didn’t I like? 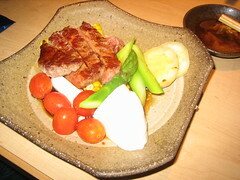 As said by many other bloggers, the service is terrible (either that or there is none) and the prices are rough- for example the beef pictured above, flamed grilled and purported to be Kobe, was a whopping $120! Don’t let yourself be ripped off, the best value is to go during the days when they have their $30 and $40 sets, although be warned on Tuesdays and Fridays their sets start from $80 a person. 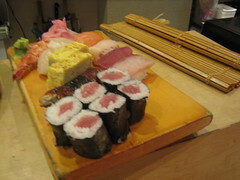 The sashimi takeaway sets are $30 and for that amount, are pretty good value as they do give quite a bit of fish. The saba set was excellent value, I forget the exact price, I think it was $13 but it could have been $18. 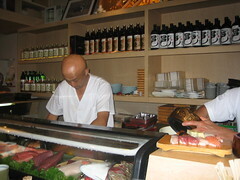 Despite his rough and sometimes arbitrary pricing, Matsuo is popular with many long-time clients who keep him healthily in business and out of reservation spots at his tiny little sushi bar. The place is also hard to find, you can either turn into Goldhill Plaza then go all the way through the carpark to the cluster of shops at the back or else enter via a small sliding door from the front of the building. Matsuo’s is actually the takeaway and value set mecca for the financial community, many of whom live nearby and swing by for a pick-up meal. Now that I’ve let that cat out of the bag, I guess somebody will have to kill somebody. Today we went for a birthday dinner at Min Jiang at Rochester Park. I really think this is one of the restaurants in Singapore with a beautiful and romantic ambience, complete with dramatic and glamourous lighting, but that is only true if you sit outside. The colonial bungalow it is housed in and the tropical garden outside make for a lovely and on the right night, windy al fresco dinner. The seating upstairs though, is noisy, cramped and entirely to be avoided at all costs. One let-down of the restaurant is that they have classically Chinese service, that is, there is almost none and all your requests will be pertinently ignored and the pace of the meal will either be delayed and slow, or rushed and insistent, depending on how close they are to closing time. Unfortunately, I don’t have many pictures as the lighting was really not ideal and I only managed to photograph the first two courses. We started with the Specialty Legendary Wood Fired Crispy and Juicy Beijing Duck ($80 – whole, $40 – half) and what sets the Rochester Park restaurant apart is that they have a custom built oven for roasting the duck and a Beijing trained specialist to operate the oven. 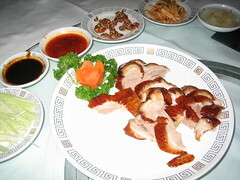 The duck was moist, thinly sliced and came with two baskets of paper thin chinese pancakes, as well as an assortment of side spreads, from ginger and garlic, to granulated sugar (for the duck neck), sour cabbage and leeks. 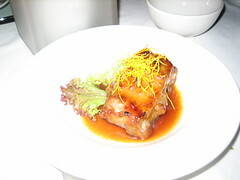 The second dish was a pork rib, honeyed and served in individual pieces with a orange dressing. It was very good, well flavoured and with a firm but plump texture. 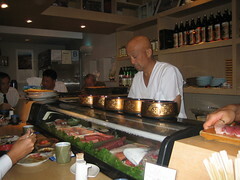 We also had the steamed fresh fish (a garoupa, $80 for a 1.5 kg fish) and lobster noodles ($16 per person). Convenient, cheap and tasty, the two restaurants in the city center of Macau in Senado Square make a good breakfast spot and a simple meal. You can catch a taxi there by telling them that you want to go to the central square or you can find your way there as it’s near the congregation of mass-market (Giordano, Baleno) shops and down the street from the churches and ruins. 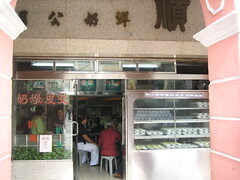 The first is a typical 'cha chan teng' or coffeeshop called "Wong Chi Kei", famous for their beef noodles. You cannot go at peak hour, well, you can but the queue snakes out the door. It's best to go later at 10am or even 10pm when all the city's best are enscounced inside the casino halls. 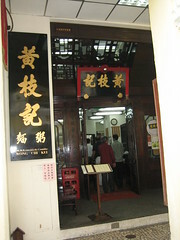 For the second-languaged challenged, this is the signnage outside the door and the modest interior. 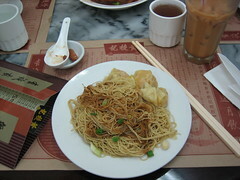 When we went for breakfast, we had the famous noodles, with extra beef tripe and shank meat. 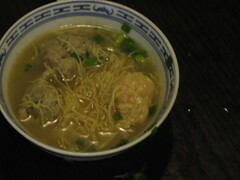 The noodles are actually better in HK, these were a little sticky and stringy, as opposed to being full of bounce and bite. They weren't bad though and really quick and simple meal. 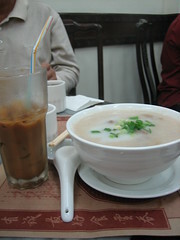 We also had the century egg porridge, which was good and the cold milk tea and coffee, which were excellent (and woke us up well after a long night at the Wynn). 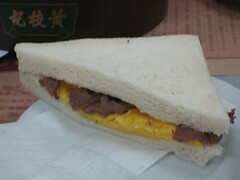 We also had the egg and ham sandwiches which the HK-er in our group enthused about as nostalgic and from him childhood but in all honesty it was a little dry. It it typical that you go to Macau, you splurge on accomodation (mostly to avoid the hookers on the Lisboa racetrack- don’t ask me to explain) and yet you hunt out bargains for food. 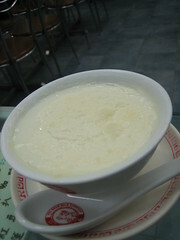 The second is le original Yee Shun Milk Company. Those who know me well will know that I am absolutely addicted to Shuang Pi Nai, or Dun Nai, "steamed milk with two films". This is basically a mixture of milk and egg white, steamed sometimes with ginger till it forms a pudding with a thin membrane layer on top. It's smooth, silky and totally yummy. Nothing makes me happier than a cold bowl of this stuff and a rich papaya milk. 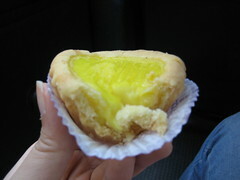 I just had to find the original Yee Shun, which many people told me was in Macau, which is also where this dessert originated. 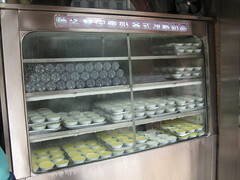 Here are the pictures of the store front, with the famous shelves of steamed custard and steamed milk (for MOP14 each). 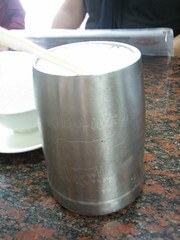 Also, more pictures of the bowls of milk pudding and the papaya milk, which comes in this kitsch engraved metal mug. The conclusion? Yee Shun in Macau is disappointing. 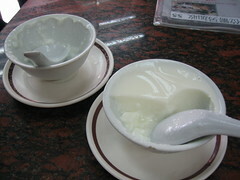 Unlike the stores in HK, the milk pudding is watery, diluted, a poor cousin to the stiffer and smoother custard available in the Yee Shun stores along Pilkem Street, Percival Street and Lockhart Street in Causeway Bay (exit C at the Causeway Bay MTR, turn right). You can see, just in the difference in the photographs, the difference in the textures between this pudding and the one in HK. 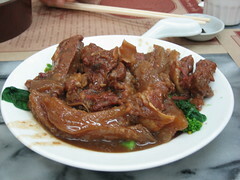 If you can get to HK, go to the bastadized city's outlets, if not, Macau Yee Shun will have to do. There are not many things to do in Macau, one can gamble and one can…gamble. Perhaps see some very rudimentary ruins and some terrible temples (Sorry, the alliteration was too much to pass on). Also, I tend to believe Macau doesn’t really have much that sets it apart from HK, although yes, it has a Wynn resort and a lot more casinos and probably I will eat my words in a few years when Macau has a Venetian, a Crown, an entire Las-Vegas-y strip and the best conference facilities in Asia. 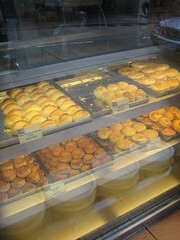 However, one thing that Macau does have, is awesome pastry shops and dried meat stores. These aren’t small affairs, the shops are really quite large, especially the Pastelaria Chui Heong chain that grew up selling those ubiquitous almond cookies in Macau. 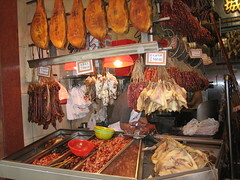 These are some pictures from the dried meats seller that we visited, sited pretty near the ruins of the St. Pauls cathedral. 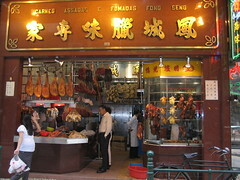 The best things to buy are the lup cheong (dried Chinese sausages), the dark blood sausages and the dried fish. I recently took a trip with my mother to HK before joining my dad in Macau. One of the first stops we made, for a casual dinner on the night we arrived, was the legendary Yung Kee. 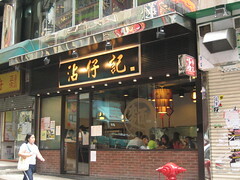 There are always celebrities and famous businessmen to be seen at this restaurant, though most have now migrated upstairs to the private Kee Club which serves both Western food and the famous dishes from its namesake below. On the night we were there, we saw a Phantom pull up and visting Hollywood royalty sweep out and into the club upstairs. Many people claim that Yung Kee isn’t that great and there is better duck elsewhere, which I wouldn’t deny but on a good night, Yung Kee is pretty darn hard to beat. I go there for primarily two things, the duck and the century eggs and I like their convenient location on Wellington Street where I’ve also found a great dumpling store, a funky budget hotel, a great massage place and a cheap, old lady-run (the best kind) hairdresser where you can get a wash and blow-dry for cheap. 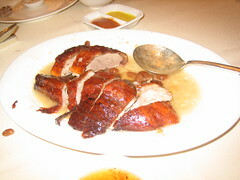 The duck is juicy and they make a great, thicker sauce in which they soak these soft red mung beans which I have a soft spot for. 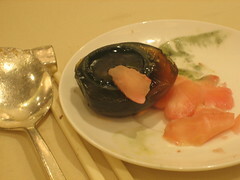 The century egg is also really well-done, with soft centers. So good that my mother consented to eat one, despite this being the time that HK was rife with rumours that the Chinese had injected artificial yellow colouring into egg exports. 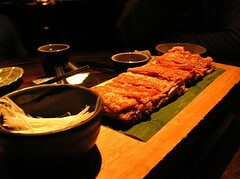 Perhaps the most beautiful restaurant in HK, the food presentation, the view and the location of Hutong all can’t be beat. I wanted to show my mom this restaurant as it’s just one of the most darkly beautiful that I’ve been to. It’s probably not my favourite place for local food and certainly, it’s beyond most people’s budgets but it certainly is a sight for the eyes. I’ve been told there is a US$39 per head minimum charge, or 300HKD but I don’t really think there are many dishes that cost less than that. 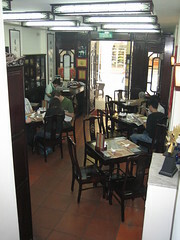 The restaurant serves Northern Chinese food but jazzed up by inventive cooking and beautifully fresh ingredients. 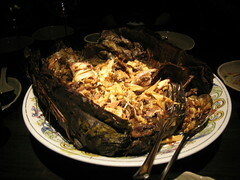 The first dish was a chicken, stuffed with glutinous rice and baked in lotus leaves, wrapped in a casket of clay. 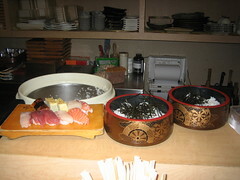 The baked bundle was brought to our table and we were invited to pound the clay shell in a mortar. The taste was wholesome and just salty enough from the chicken oils that had infused the rice. The second dish was also beautifully presented, in a painted, native red-weave basket. 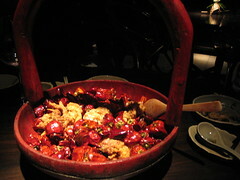 The colour of the basket was highlighted by the bright red dried chillies, intersperced with generous pieces of soft-shelled crabs. This dish was actually way too spicy for my tastes but my less spice-wuss Singaporean friends just lapped it up. This dish can also be done with Sichuan prawns. The third dish was a simple saute of mustard greens, well done, if a bit oily. In this picture, you can see how fresh each piece is and how it’s cooked just till it’s translucent, so that it still has plenty of bite but the sweetness of the vegetable is released. The fourth dish was my favourite, as well as one of the restaurant’s signature dishes. The lamb ribs are juicy on the inside and crispy on the outside and they come presented on a half meter long wooden plate or sometimes a narrow stone slab. This is a presentation that I’m actually seeing more and more in Asia but I believe that Hutong was one of the first places to debut it. 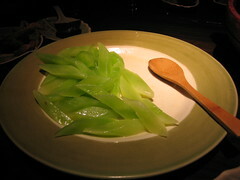 It is served with a thin soy sauce with sliced ginger and hot chillies. The secret to the two textures is that the lamb ribs are deboned and slow cooked while the skin is fried to a crisp and the two parts are reassembled. Overall: The taste of the food just doesn’t live up to how beautiful the dishes and restaurant are but this restaurant in any top city would be considered a must-try. Ah...my favourite place in HK. 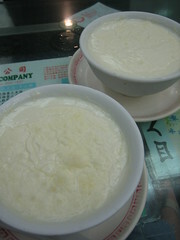 No, that’s pretty sad but seriously, this milk pudding is the best. Yes, I have heard of the one in Jordan and I promise to try it the next time I’m in HK but I have it on good authority that it is only as good as Yee Shun. This company only deals in milk and it’s logo is a cow and it’s all about flurescent signs of cows (as many people as there are in Singapore) and their product is great. For the uninitiated, before you go there and curse at me, I should add that Shuang Pi Nai, or Dun Nai, “steamed milk with two films” is an acquired taste. This is basically a mixture of milk and egg white, steamed sometimes with ginger till it forms a pudding with a thin membrane layer on top. While smooth and silky, some people find the taste of powdered milk overwhelming or find it too ‘jelat’ to eat an entire bowl (I, on the other hand, can eat two). 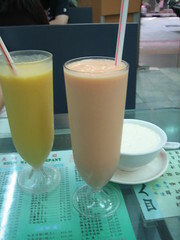 The papaya or mango milk here is also very good, look at the creamy colours! This unpretentious dumpling soup shop on Wellington Street is a treasure! Introduced to me by a friend as “There’s this place where the dumplings are the size of your palm”, it didn’t disappoint. These are pictures from the store front and inside the store, which is air-conditioned (which I appreciated especially during the summer). The dumplings are chock full of prawn and black mushroom, which you can see through the thin skins. 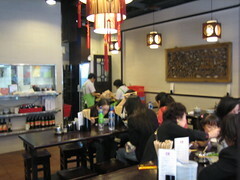 You can also see the ladies in the back of the shop, stuffing the dumplings from a mountain of prawn stuffing. I get a kick out of that. My mom’s opinion was “Shiok!” and she really liked how each regular serving is a small bowl so that you can have it for an in-between-meal snack. Most Singaporeans think Mak’s Noodles is the place on Wellington Street to go to, but take it from a very picky noodle eater, Mak’s has nothing on this place and the service at Mak’s is just god-awful, having fattened their coffers so much from Singaporean tourists. 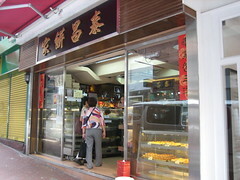 It was reported that this shop had closed down and egg tart lovers around the world mourned. Fear not, it has not closed down…it has merely moved to across the street. It used to be at 32 Lyndhurst Terrace and I’m not sure if that is the new address but I found it along the way walking to Lyndhurst Terrace anyway and I usually walk there from Wellington Street (no prizes for guessing why). I walk up Lyndhurst, toward the GOD store at the top of the street and the store is right there. 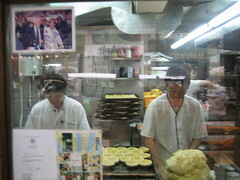 The picture on the right shows the guys in the glass making the tarts with the famous, laminated picture of Chris Pattern. Tai Cheong bakes hundreds of egg tarts daily, as well as other Chinese pastries, so you're assured of a fresh, warm tart no matter when you go. 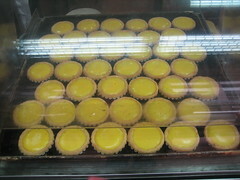 The egg tarts are beautifully baked with the wobbly custard still hot and slightly liquid on the inside but firm and springy on the surface. This paired with the savory shortcrust pasty is a persuasive pairing, my mother, usually not a dessert lover, was completely sold and we returned several days in a row to buy boxes of the tarts. 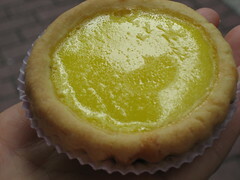 The best way to eat them and compose an ode to egg tarts, is hot on the street corner.